The hardcover publication of A Meal in Winter established Hubert Mingarelli as one of the most exciting new voices in international fiction. Mingarelli’s timeless novel begins one morning in the dead of winter, during the darkest years of World War II, with three German soldiers heading out into the frozen Polish countryside. They have been charged by their commanders with tracking down and bringing back for execution “one of them”—a Jew. Having flushed out a young man hiding in the woods, they decide to rest in an abandoned house before continuing their journey back to the camp. As they prepare food, they are joined by a passing Pole whose virulent anti-Semitism adds tension to an already charged atmosphere. Before long, the group’s sympathies begin to splinter when each man is forced to confront his own conscience as the moral implications of their murderous mission become clear. 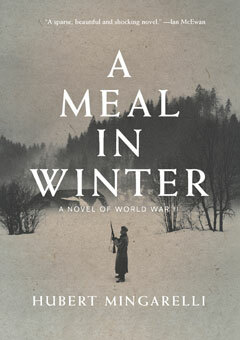 Described by Liberation as “impossible to put down,” A Meal in Winter, with its ”simple declarative sentences and crystalline, cinematic vignettes” (Publishers Weekly) is a “masterpiece of empathy and horror” (The Guardian) that recalls the cinema of Polanski and Hitchcock, the work of Isaac Babel and Ernest Hemingway, and Louis Begley’s Wartime Lies.